Anodized 6061-T6 Aluminum machined attach bars for bed-type mounting of Rotax 912-series engines. 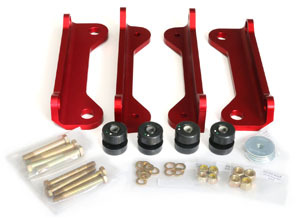 Designed to work with Legacy and B-Model Sonex Aircraft Rotax engine mounts. May be suitable for other custom bed-mount applications on other experimental aircraft. See Rotax Attach Bar Dimensions & Hole Specifications. Designed to work with ACV-P01-19 Motor Mount Rubber Shock Mounts (Qty 8 required), which requires use of AeroVee mount pin specifications.